MatchDayMe app: insight & download. MatchDayMe (MDM) is a free photo and video sharing app, where football fans can share their own match day experiences as well as viewing those of fellow football fans and opposing fans. So you don’t have to be “friends” with those supporters in the lower tier who always have their phones out for the best moments! You can also view all your real friends’ match day moments, no matter which team they support, no matter which match they’re at or watching, by using our unique Squad Feed (similar to a Friends function, but better). MDM features all 92 teams in the top 4 English football leagues. Each of your team’s games appears as an Event in the app’s Dugout page. You and the fans of the opposing team can upload photos and videos during the build up to the game, during the game itself, and after the game. You can comment on other fans' content, sharing friendly banter and information as the game progresses. 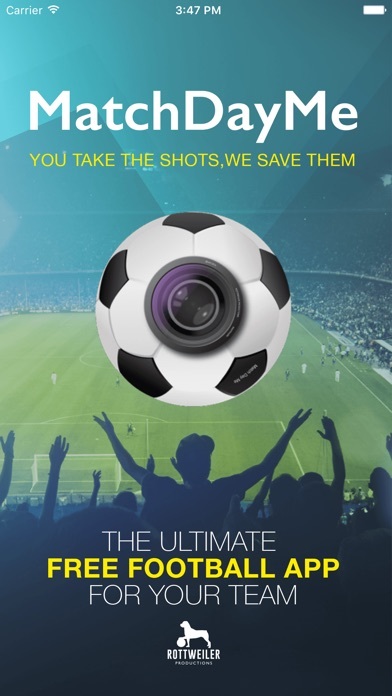 Get the complete fan’s eye view of every match as it happens! All the games are stored so you can also look back and reminisce about the most memorable games. It's easy to build your Squad by simply adding Fans from the list of app users on the Contacts/Phone book page, or by tapping the Follow icon next to their posts and comments. MDM is dedicated to the beautiful game, so you won't get interrupted by irrelevant posts about someone's dinner, their pet dog or what they're wearing that day - unless, of course, it's the colour of their footy shirt that they want to show off and celebrate. So, whether you support Arsenal, United, Chelsea, City, Rovers, the Blues, Reds or Yellows, or any of the other 92 awesome English football league clubs, then MDM is for you. Whether you’re Premier League, Championship, League One or League Two, download MDM and get sharing with your fellow supporters. You won’t need any other fan app! Enhance your match day experience and join the MatchDayMe community. Support your team, and remember - You take the shots...We save them! 21 June 2018 : Free! 1 February 2016 : Free!